We give a reality check to organic myths regarding organic food, agriculture, yield, and more. Here at Grinning Planet, we know the difference between a myth and a rumor. A myth is that dragons once existed; a rumor is that Barney the Purple Dinosaur is thinking about making a career change to become Barney the Flaming Dragon. We also know that myths can strongly influence people's beliefs. When it comes to organic food and agriculture, we suddenly feel the need to unsheathe our double-edged pen and slay a few myths. 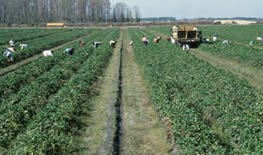 Organic farming must be inefficient, since organic food is more expensive than regular food. the "externalities" of conventional agriculture—i.e. costs that are NOT included in the price of conventional agriculture's products, such as the ill effects on human health and the environment caused by the chemicals in our food and the pollution generated by conventional farming. 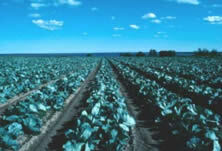 An acre of organic agriculture can't produce as much food as an acre of conventional chemical-based farming. Research has shown that when acreage is first converted from conventional to organic, there is a temporary lowering of productivity. But over time, the natural fertility of the soil returns, and after three years or so, organic yields are equal to or superior to the prior yields from conventional crops. Think of the initial dip in productivity as withdrawal symptoms. The amount of pesticides in non-organic food is insignificant. the children who ate mostly organic diets had levels BELOW the negligible-risk threshold. There is no nutritional difference between organic food and non-organic food. Chemical farming damages the natural fertility of soil because it kills or suppresses the beneficial soil organisms that help ensure the nutrient richness of soil. The soil on an organic farm is loaded with these beneficial organisms and is chock-full of micro-nutrients. The result is that organically grown plants are healthier and more resistant to disease, and the food from them is more nutrient-rich. Research done at the University of California at Davis found that organically grown berries, corn and vegetables have over 50% more antioxidants than the same conventional crops. (Antioxidants are nutrients important to avoiding cancer and maintaining good overall health.) Studies also suggest that organic foods are higher in a variety of minerals. Organic farming also does not cause the many problems associated with modern conventional farming, such as groundwater and streams that become polluted with pesticides or rivers and bays that are dying from oxygen deprivation due to fertilizer runoff. So, that should dispel some of the common misperceptions about organic agriculture and organic food. The really good news is the taste of organic food—most people think it has much more flavor than conventionally produced food. And just think about it: Do you really want your kids sticking non-organic french fries up their noses? A practical guide to sustainable gardening practices. Good illustrations help explain the techniques. Subjects include soil health, plant needs, best tools, weed and pest control, garden and landscape design. "When you look at an apple, some people would say the non-organic apple is cheaper than the organic apple. But when you factor in what you're receiving in terms of vitamins, minerals, etc., the organic apple—on that basis—is cheaper than the non-organic apple."